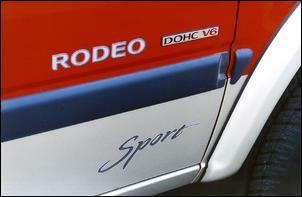 Priced at $42,300 the Rodeo Sport Space Cab is nearly a good car. When does an out-and-out commercial vehicle become a crossover recreational vehicle? Usually the marketplace determines that on the basis of equipment level: a barebones, rubber-matted, poorly-soundproofed ute won't attract the same customers as the model fitted with twin airbags, leather steering wheel and CD stacker. 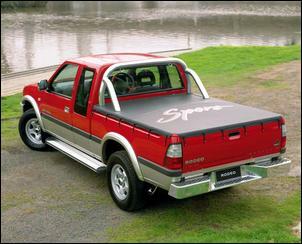 Which brings us to the Holden Rodeo LT Sport Space Cab. Priced at $42,300 (when base models of the 4x4 V6 Rodeo cost only $31,460) the Sport Space Cab is a definite for the recreational crowd. After all, if the car's gonna be drudging through mud all day on a farm or building site, who's going to spring for two tone paint, a chrome sports bar, wheel arch flares, rear bumperettes, multi-reflector headlamps, side steps, chrome-finished mirrors and door handles, 16 x 7 five-spoke alloy wheels with 245/70R-1075 tyres, power steering, central locking, power windows, power mirrors, six-CD stacker, and a leather wrap steering wheel? So this test unashamedly looks at the Space Cab from the perspective of a recreational and everyday tool, rather than concentrating on the vehicle's ability to lug three-quarters of a tonne of plumber's tools around. And, the front half of the vehicle is a pretty good news story. 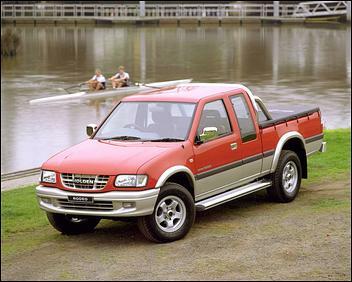 The Rodeo is powered by a delightful 6V91 3.2-litre V6, built (as is the rest of the car) by Isuzu in Japan. The all-alloy, over-square, quad cam engine uses a compression ratio of only 8.6:1 and so is completely unfussed drinking plain ol' unleaded. But there's still 140kW (at 5400 rpm) and 265Nm at 4200 revs. The torque peak as high as 4200 rpm? But that's a deceptive spec, for the Rodeo is happy trundling along with near-idle revs aboard, lugging in second or even third gears. It's impossible to make the engine detonate. The engine is progressive and smooth, happy to rev to 6250 rpm or be short-shifted in every gear. Despite some pronounced fan noise on start-up, it's also generally quiet. 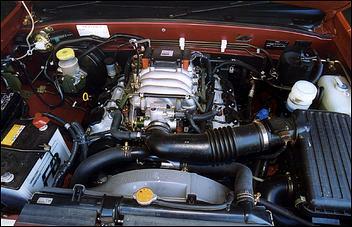 It is, as you would expect, an infinitely nicer engine than the domestic Holden pushrod V6. However, the six-cylinder can drink fairly strongly - we recorded a fuel consumption of 13.7 litres/100km. A 75 litre fuel tank is fitted. Backing the V6 is a 5-speed manual. Gear changes are light and fluid - even with the 'box cold - and the clutch is also quite light. However, take-up can be a little sudden. 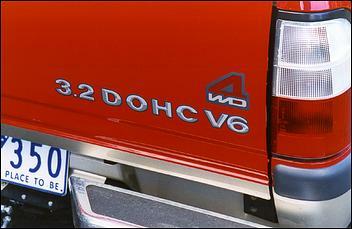 Fifth is a 0.809 overdrive ratio and the final drive 4.3:1. A manually-selectable four wheel drive system is used, with 4WD High and 4WD Low ranges available. Auto-locking front hubs are fitted, so to select 4WD (which can be done at up to 100 km/h) it's just a case of pushing in the clutch and moving the second gearlever. However, because there's no centre diff, four-wheel drive cannot be used on dry bitumen - rather than an all-wheel drive stability-enhancing device, it's for use in slippery conditions only. The cabin is bright and airy, with good visibility in all directions. The 'extend cab' portion gives a storage space behind the seats - while useful for shopping and the semi-permanent storage of items that you want to leave in the car, there's no blind to cover the items and accessing the space is a little awkward. The rear windows prop open 10mm or so at their trailing edge, aiding airflow through the cabin. 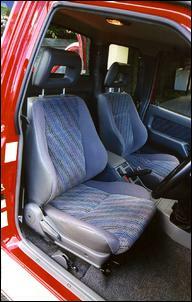 The seats are excellent, with great side and lumbar support. In fact, the cabin is quite 'car-like', with its twin airbags, power steer, electric mirrors and windows and trim. However, there are some omissions most unusual in this price range - little things, admittedly, but still omissions. The seatbelt 'B' pillar mounts are fixed (rather than being height-adjustable), there are no vanity mirrors on the back of the visors, the key has no remote function, and the speakers used with the 6-stacker CD-radio are abysmal. In fact, the rear speakers are just mounted directly into flimsy plastic trims, and can be wriggled around at will. The aerial is also a manual model, rather than the pretty well universal electric design. The recirculating ball steering gives good feel, and while a little slow around centre, is consistent in its action and suits the rest of the vehicle. (The Rodeo isn't a car where you want razor-sharp steering, is it?) The pedals are well-spaced but we found that when wearing large shoes (or work boots) the toes fouled the pedal supports. Build quality - inside and out of the galvanised panels - looks excellent (again better than the locally produced Holdens) and the controls operate with a quality feel. Hmm, so what we have here is a largely comfortable, practical vehicle with occasional off-road competence - just the thing for someone who wants to do some towing or every few weekends throw a couple of trailbikes in the back? Er, no - or, more accurately, only 'maybe'. Why? Well, head out to the rear of the vehicle and you're in for a shock. The sophistication of the engine, cabin and steering suddenly falls into an almighty heap. Yes, that is a live rear axle suspended on leaf springs that you see. Yes, those are drum rear brakes. And sure, while leaf springs are still widely used in commercial applications, these are not only leaf springs - but they are also leaf springs as stiff as buggery. Drive the Holden Rodeo LT Sport Space Cab down a normal suburban street and each bump will be barely noticed by the double-wishbone, torsion bar front suspension - it's relatively supple and compliant. But when the rear wheels hit that same bump - hold on! You can literally be bounced right out of your seat, seatbelt locking before you hit the roof. Go around a corner and the incredible rear roll stiffness causes the back to skip and jump, lifting an inside wheel and spinning away the torque. (Despite some brochure references to the contrary, this model doesn't have an LSD.) To an extent this wheelspin limits the lateral movement of the tail - the car is progressive in its cornering behaviour, except in the wet where the rear can get very excited. The stiff rear end also upsets the braking - despite the presence of a load proportioning valve, brake hard while unladen and the rears lock as they go light over every bump. No ABS is available. The Rodeo LT Sport Space Cab has tray carrying capacity of 740kg (with a full load of fuel and two people), and of course that's why the rear springs are so stiff. But, as we said in the first paragraph, this is a vehicle aimed much more at recreational and relatively mild commercial users rather than those likely to be using every kg of load capability. We think that softer rear springs are a must-have - that, or carry a few hundred kg around with you the whole time. 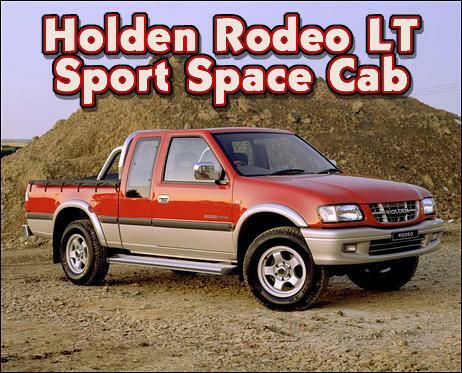 The Holden Rodeo LT Sport Space Cab was supplied for this test by Holden Ltd.